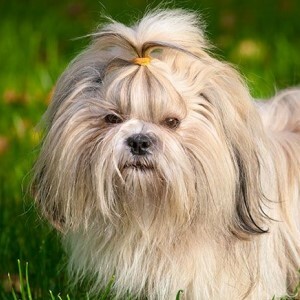 ﻿Bruce Goodman's "Merran’s little Shih Tzu"
Merran loved her little Shih Tzu. Throughout her life she had always had a little dog, but Lan Dong was her favourite canine of all time. Merran always stood in her kitchen to have her breakfast. It was usually just a slice of toast with butter and honey, always made meticulously after she had taken her heart pills and downed a large glass of water. If she dropped some toast crumbs on the kitchen floor, Lan Dong would instantly snaffle them up. Anyway, on this particular day, as she was taking her medication, Merran accidently dropped her open bottle of heart pills.